You've visited the rest, now visit the best! Tender slices of beef marinated in rice wine, seared in high flame to retain its natural flavor then sauteed with scallops or shrimp and mushrooms in a succulent oyster sauce and served at your table on a sizzling platter. Shrimp sauteed with green onion, shredded white onion in aromatic black pepper sauce. Lightly fried shrimp and honey glazed walnuts in a specially prepared creamy sauce surrounded by crisp cucumbers, cherry bombs and lemons. Well selected shrimp lightly fried to retain its flavor sauteed with chef's special mild spicy sauce on crisp lettuce. Jumbo shrimp, scallops, and chicken sauteed with garden greens and served in a crispy noodle nest. Tender fried battered shrimp, surrounded with fresh steamed broccoli and served with red hot sauce on the side. Sliced chicken, tender sliced beef and shrimp sauteed with vegetable goodies, surrounded with fried wontons, and showered with chef's special sauce. Jumbo shrimp, scallops chicken, pork, and beef sauteed with broccoli and served on a sizzling hot plate. Sliced beef sauteed with green onion, shredded white onion in aromatic black pepper sauce. Sliced beef quickly stir-fried in a tempting brown sauce topped with sesame seeds. Lightly battered slices of flank steak retain their beautiful crispiness in zesty orange sauce, surrounded with fresh steamed broccoli. Well selected sliced chicken lightly fried to retain its natural flavor sauteed with chef's special mild spicy sauce on crisp lettuce. Sliced chicken sauteed with green onion, shredded white onion in aromatic black pepper sauce. Well selected sliced chicken, sliced beef, and shrimp sauteed with bamboo shoots, water chestnuts, celery, onion, green pepper, and peanuts in this well known Szechuan spicy sauce. Divided into equal portions of sweet and sour shrimp, pork, and chicken - garnished with crescents of thin-sliced orange between portions. Sliced chicken, sliced beef, sliced pork, sauteed with assorted vegetables in spicy brown sauce. Sliced chicken, sliced beef and sliced pork sauteed with bamboo shoots, water chestnuts, celery, and mushrooms in a light sweet Szechuan sauce. Tender chunks of chicken pre-fried until outside is crispy then sauteed jin chef's special and medium orange peel sauce. The general's favorite dish - Tender chunks of chicken quickly fried until outside crispy. Stir fried with diced celery, baby corn and mushrooms in Kung Pao sauce. Boneless breaded chicken breast, deep fried until crispy, topped with snow peas, bamboo shoots, mushrooms, and carrots in brown sauce sprinkled with sesame seeds. White chicken breast batter fried until crispy and sautéed with lemon sauce. Scallops, shrimp, carrots, baby corn, snow peas and egg white. Deep-fried battered boneless duck in a spicy brown sauce. Deep fried battered boneless duck in brown sauce. Deep fried battered boneless duck and pineapple showered with sweet and sour sauce. Sliced chicken sauteed with water chestnuts, bamboo shoots, celery, peas, mushrooms, peanuts, cashews, and almonds with Peking sauce. Marinated chicken sauteed with pineapple, green pepper, and tomatoes in brown sauce. Tender sliced chicken sauteed with fresh mushrooms and green onions in chef's special sauce. Deep fried battered boneless chicken sauteed with red chili peppers in a light sweet Szechuan sauce. Boneless chicken deep fried and cooked with pineapple, white onions, and green pepper in a sweet and sour sauce. Tender sliced chicken cooked with baby corn, green pepper, white onions, and fresh mushrooms in spicy brown sauce. Marinated sliced chicken sauteed with broccoli, pea pods, bamboo shoots, white onions, green peppers, water chestnuts, and Napa cabbages in brown sauce. Sliced chicken sauteed with pea pods, carrots, bamboo shoots, and green onions in a spicy brown sauce. Tender sliced chicken sauteed with assorted vegetables in brown sauce. Sliced chicken cooked with celery, bamboo shoots, mushrooms, water chestnuts, and green onions in a light sweet Szechuan sauce. Marinated sliced chicken cooked with broccoli, water chestnuts, mushrooms, and pea pods in a special homemade sauce. Boneless chicken cooked with celery, water chestnuts, bamboo shoots, peas, mushrooms, and crispy almonds in a brown sauce. Boneless chicken cooked with celery, water chestnuts, bamboo shoots, green onions, and cashews in a brown sauce. Diced chicken cooked with water chestnuts, celery, mushrooms, and green onions in a garlic sauce. Diced chicken sautéed with bamboo shoots, water chestnuts, celery, white onions, green peppers, and peanuts in spicy Szechuan sauce. Marinated sliced beef sauteed with bamboo shoots, water chestnuts, celery, white onions, green pepper, and peanuts in spicy Szechuan Sauce. Tender sliced beef sauteed with fresh mushrooms and green onions in chef's special sauce. Tender sliced beef sauteed with pineapple, green pepper, and tomatoes in brown sauce. Marinated sliced beef cooked with carrots, celery, bamboo shoots, and green onions in spicy brown sauce. Sliced beef sauteed with assorted vegetables in brown sauce. Marinated sliced beef cooked with green pepper, white onions, baby corn, and fresh mushrooms in tea flavored spicy brown sauce. Marinated sliced beef sauteed with snow pea pods, bamboo shoots, and mushrooms in oyster sauce. Sliced beef sauteed with green onions, and bamboo shoots served on a bed of crispy vermicelli. Marinated sliced beef sauteed with baby corn, water chestnut, bamboo shoots, pea pods, and broccoli in a fragrant sauce. Marinated scallops sauteed with broccoli, straw mushrooms, pea pods, baby corn, bamboo shoots, and water chestnuts with a special chef's sauce. Marinated scallops sauteed with celery, bamboo shoots, water chestnuts, mushrooms, and green onions in a szechuan sauce. Sliced chicken and shrimp sauteed with water chestnuts, bamboo shoots, and cashews in a special chef's brown sauce. Sliced chicken, sliced beef, and shrimp sauteed with broccoli, baby corn, pea pods, bamboo shoots, and mushrooms in specially prepared white sauce. Diced chicken and shrimp sauteed with celery, bamboo shoots, water chestnuts, white onions, green peppers, and peanuts in well known szechuan sauce. Fresh gulf shrimp sauteed with pea pods, carrots, bamboo shoots, and green onion in spicy brown sauce. Fresh gulf shrimp cooked with water chestnuts, celery, mushrooms, and green onion in garlic sauce. Fresh gulf shrimp cooked with water chestnuts, and chopped white onions in a mild red ginger sauce. Fresh gulf shrimp simmered in rice wine and cooked with mushrooms, water chestnuts, and peas in a smooth lobster sauce. Fresh gulf shrimp cooked with baby corn, water chestnuts, pea pods, mushrooms, and broccoli in brown sauce. (With Sliced Pork) Marinated sliced pork sauteed with lightly fried bean curds with mixture of vegetables in brown sauce. Lightly fried bean curds sauteed with assorted vegetables in brown sauce. A combination of the best vegetables with a special Szechuan sauce. A good vegetarian treat. Cheeseburgers are 100% pure ground beef, charbroiled served thick and juicy with mayo, lettuce, onions, tomatoes, and pickles. Served with Oriental Salad, Steamed Rice, and a choice of Egg Drop Soup, Spicy Sour Soup, or Wonton Soup. White sauce, Brown sauce, or Majestic sauce. Served with an Egg Roll and Steamed Rice. Special combination plate selections limited to the items listed below. Exclude Scallop Entrees, Shrimp Majestic, Shrimp Lobster Sauce. Experience the most unique atmosphere in Southern Minnesota & its surrounding area. 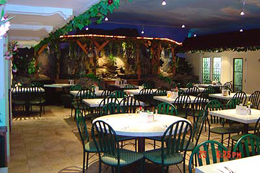 The China Restaurant offers a beautiful courtyard design, accented with the elegance of China & including a bountiful waterfall for your dining pleasure. Monday - Friday 11:00 a.m. - 2:00 p.m.
Monday - Thursday -4:00 - 9:00 p.m.
Friday - 4:00 - 9:30 p.m.
Saturday - 12:00- 2:30 p.m. 4:00 p.m. - 9:30 p.m.
Sunday - 11:00 a.m. - 2:00 p.m. 4:00 - 9:00 p.m.